Wheel Collars are a handy way to lock wheels on a axle. These can also be used to hold props on non-threaded shafts. The collars are made of brass and are chrome plated to resist corrosion for trouble-free use time after time. 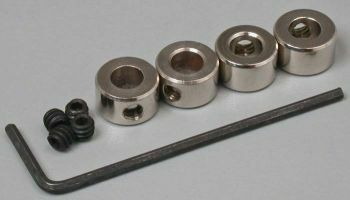 Four 3/16" inner diameter (.187" 4.75mm) plated brass wheel collars.